Occasionally we’ll get a call about an issue at a proper­ty that falls just short of making the local news. Those have included major structural components so deteriorated they could be pulled apart by hand, bearing walls with three-inch-wide cracks, and roofs blown off under conditions of high wind speed. This is the story of a roof failure that occurred during the derecho that struck this region in June 2012, and was caused by a troubled marriage between new technology and old. The affected building is a seven (7)-story, masonry-faced struc­ture that was erected in the late 1950’s and had recently under­gone roof replacement. The roof deck was plywood, supported by 2×12 joists with 2x4s nailed along the top of the roof joist at the edges to promote airflow under the deck. The roof joists were set in pockets along perimeter masonry bearing walls without any positive attachment. In effect, the entire roof structure was held in place by gravity and some nails. Review of the original construction documents revealed that the roof was constructed according to design and also revealed that the original roof membrane was a built-up system with gravel surfacing. Figure: Original framing condition with roof joists set in pockets alon gthe bearing wall, with no mechanical connection. The roof failure occurred along the west side of the building and was concentrated at the comers and edge, which is to be ex­pected since the corners and edges of buildings experience the highest uplift forces from wind. It was concluded that the 2×4’s nailed to the top of the roof joists were not able to withstand the uplift forces imposed by the heavy wind and had separated from the roof joists. There was also evidence that the 2×12 roof joists had lifted from the pockets in the bearing wall during the event. Temporary repairs were made to secure the roof and to prevent water infiltration until a permanent solution could be designed and installed. 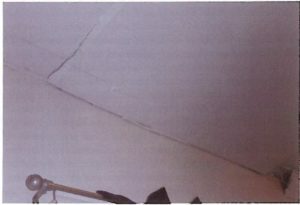 Figure 2: Damage to the interior finishes along the ceiling from the roof failure. The original built-up roof was fully adhered and surfaced with gravel. That roof system was replaced in the early 1990’s with a fully adhered, un-ballasted EPDM (ethylene propylene diene monomer) or “rubber” roof. The EPDM roof was reported to per­ form adequately for about 20 years, without any major issues apart from normal aging. 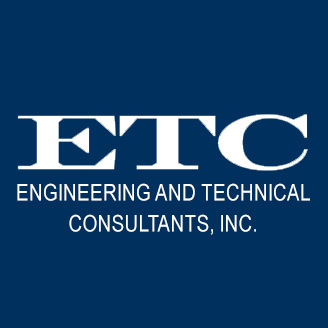 When it became necessary to replace that roof, a mechanically fastened TPO (thermoplastic polyolefin) system was selected. Gravity held the roof assembly in place for more than 50 years prior to the 2012 failure. The original built-up roof was certainly heavier than the failed TPO system. The interim EPDM roof was probably lighter than the TPO, suggesting that weight alone was not to blame for the failure. The new TPO roof represented a significant departure from both the original built-up system and the EPDM system. Those systems were fully adhered to the deck, which distributed uplift forces over the entire roof The TPO system was mechanically fastened in a pattern determined to resist the calculated wind uplift for the structure. However, mechanically fastening the membrane changed the way that wind uplift forces were trans­ferred to the structure by shifting the loads to the roof deck through single connection points, instead of evenly distributed across the deck. 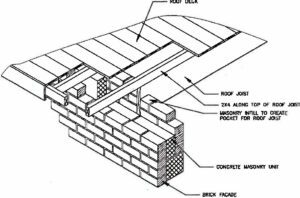 It’s believed that during the involved wind event the uplift force along the roof edge was greater than what the fastening of the 2×4’s along the roof joists could withstand. The fasteners (nails) were overloaded, they pulled out and the roof peeled back. The force was also sufficient to move the joists in their pockets, as evi­denced by damage to interior drywall and trim elements. While the configuration of the underlying structure was not re­vealed by removing the membrane, a review of the construction documents would have shown that the roof structure was not at­tached to the bearing walls. This condition would be unaccept­able under current building codes. The design of the replacement roof should have included an evaluation of the structure to deter­ mine how a change in membrane attachment would affect the ability of the roof to resist uplift, and measures to provide adequate resistance. The main objective of the repair work was to ensure that the roof was adequately attached to the structure, without voiding the manufacturer’s warranty on the new membrane. Because the pri­mary defect affects the entire roof, repairs were carried out on the entire roof, not just at the areas of obvious failure. Approximately six (6) feet of the roof membrane was removed along the entire perimeter of the structure. The roof deck was re­moved to expose the framing members below. The 2×12 roof joists were fastened to the masonry bearing walls with custom steel brackets and anchors embedded into the masonry wall and secured with high-strength epoxy. The anchors were tested to en­sure adequate load capacity could be achieved prior to full imple­mentation of the repair. 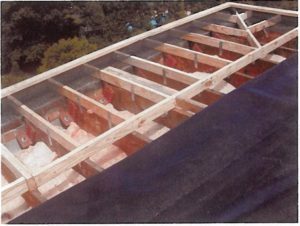 The 2×4’s supporting the roof deck were attached to the joists with metal straps and the affected deck was replaced with new sheathing, fastened to resist wind loads. The TPO membrane was repaired and reviewed by the manufacturer to ensure that the warranty was maintained. Any time a major building element is replaced, it’s important to consider what effect that change will have on the underlying structure and that’s especially true for older buildings. Designers can’t possibly know the properties of materials and methodologies to be developed decades in the future and obviously can’t design with them in mind. Accommodations are often necessary to properly integrate new products and practices with older architecture. 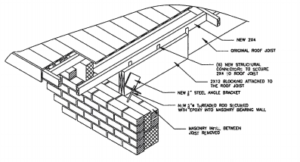 Figure 3: Roof joists were connected to the mason­ry bearing walls and the 2×4’s along the top were connect­ed to the joists with engineered brackets to properly transfer the load to the structure. The design of the replacement roof should include an evaluation of the structure to determine how a change in membrane attachment will affect the ability of the roof to resist uplift, and measures to provide adequate resistance. Nick has worked as a structural engineer at Engineering and Technical Consultants, Inc. since earning his B.S. in civil engineering in 2007. He focuses on helping building owners with evaluation and repair of their property.